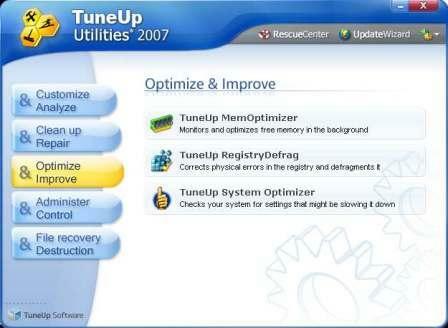 TuneUp Utilities 2007 is an older version of popular TuneUp Utilities (current version 2009) that cleans, tunes, tweaks and optimize the PC computer system. The program able to provide fast, effective, intelligent, and safe Windows optimization which a set of tools, beside protecting user’s personal settings and customization, and can provides recommendation options and explain performance results before action is taken. 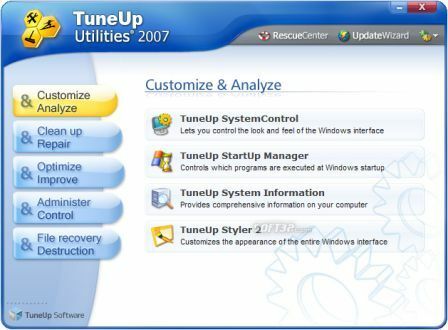 TuneUp Utilities include tools and utilities such as TuneUp System Control (look and feel of Windows interface), TuneUp Startup Manager (program to start), TuneUp System Information, TuneUp Styler 2 (customize appearance of Windows interface), TuneUp DiskCleaner (removes junk), TuneUp Disk Doctor (detects hard disk error), TuneUp Disk Space Explorer (view hard disk usage), TuneUp RegistryCleaner (removes invalid entries), TuneUp Process Manager, TuneUp Registry Editor, TuneUp Uninstall Manager, TuneUp MemOptimizer (optimize memory in background which no longer included in new version), TuneUp Registry Defrag, TuneUp System Optimizer, RescueCenter and more. Then, users are required to use the registration serial license key code JMNCG-FKNGR-WMAMT-FRTQL-BLYJB-XDYMX together with their name to register and unlock the software as full commercial fully functional version product without usage restriction or time bomb. Tip: Some users noted that the official setup installer for TuneUp Utilities 2007, TU2007TrialEN.exe, can be used to register with the above registration key too. Free TuneUp Utilities 2008 is now available.